Mitchell Glasson specializes in advisory consulting and the disposition and acquisition of single-tenant NNN properties nationwide. His vast network of clients ranges from private investors to some of the largest global corporate restaurant companies, publicly traded REITs, private equity funds, franchise operators, and developers. This expansive network allows him to benefit his clients by strategically positioning them with the most active pool of buyers and sellers. Mitchell prides himself on creating long-standing relationships, built on the backbone of trust and transparency. He uses his comprehensive knowledge, unrelenting determination, and proven work ethic to guide his clients toward their investment goals. As an expert of the net-leased retail market, Mitchell has the repertoire to add value with a variety of tenant types including quick service, fast casual, and casual dining restaurants, auto service, drug, dollar, and gas & C-stores. Although experienced and accredited to underwrite all national tenants in the net lease sector, Mitchell has always held a specific emphasis on all quick-service restaurants, having helped develop the Burger King, Church’s Chicken, El Pollo Loco, Del Taco, McDonald’s, Popeyes and Yum! Brands verticals. His team’s proven track record in private individual assets and portfolio transactions have assisted in growing one of the largest national market shares. 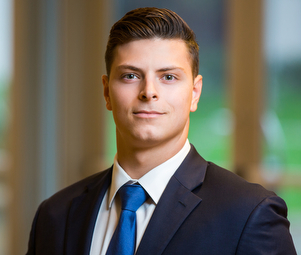 As a part of the Sale-Leaseback program for Matthews Real Estate Investment Services™, Mitchell enjoys utilizing his financial background in assisting operators in the underwriting, lease structuring and marketing processes of their customized program.